Three members of Staffordshire’s emergency services were on hand today, Wednesday 18 December, to present representatives from Caudwell Children with a cheque for over £20,000. The money was raised when Staffordshire Fire and Rescue Service, went glove to glove with Staffordshire Police, in their annual boxing event at the Fenton Manor, Sports Complex, on 16 November. PC Colin Gay, aged 40, from Staffordshire Police, began boxing as part of a fitness regime some three years ago. He has been one of the driving forces behind the friendly rivalry between the services, which has seen them compete on three occasions. 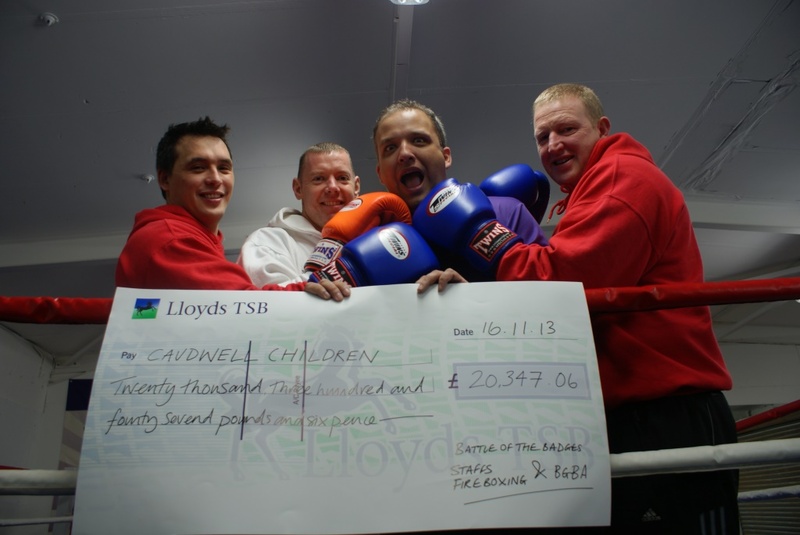 Together with 38-year-old Tim Chan, and Chris Elikin, 45, from Staffordshire Fire and Rescue Service, he handed over the cheque to Gareth Aston, Events Manager for Caudwell Children. The most recent event, titled ‘Battle of the Badges – The Showdown’, took place in front of 750 excitable spectators, each paying upwards of £25 for the pleasure of seeing their colleagues, friends or acquaintances, battling it out to become ‘Battle of the Badges’ Champions. The event saw 14 hardy souls going head-to-head over three, 2 minute, rounds. With the aggregate score at one competition apiece, each bout took on increasing importance as the fear of failure grew. When the bell rang to conclude the evening’s entertainment it was Staffordshire Fire and Rescue Services, who were punching the air in triumph having gone 2-1 up in the series.